The two handkerchiefs with opposite centres are carefully rolled up under the vest, one each side. The other two handkerchiefs are exhibited and centres cut out with a pair of scissors. Now present the cut one, red, in the right hand rolled up in the shape of a ball as near as possible imitating the red one with the green centre which is under your vest. This is exchanged for the one under the vest on returning to the stage. The procedure is exactly reproduced when the centre of the other handkerchief is cut. 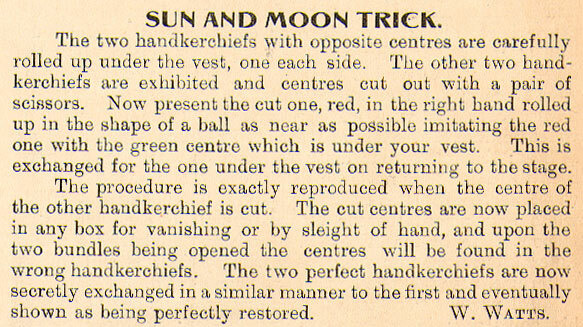 The cut centres are now placed in any box for vanishing or by sleight of hand, and upon the two bundles being opened the centres will be found in the wrong handkerchiefs. The two perfect handkerchiefs are now secretly exchanged in a similar manner to the first and eventually shown as being perfectly restored. W. WATTS.